Introducing Star Classic Lawn Suit 4016-C from Star Classic Lawn Vol-2 2017 Collection at discount price in Pakistan. Naveed Nawaz Textiles is the manufacturer of Star Classic Lawn. The company is so popular among women due to their high quality fabric which is available at quite reasonable rates. 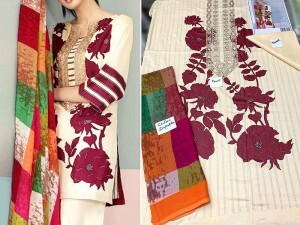 In this offer you will get an Unstitched 3-Piece Star Classic Lawn Suit 4016-C that includes: 2.5 Meter Printed Lawn Shirt, 2.5 Meter Lawn Dupatta, and 2.5 Meter Lawn Trouser. Order Star Classic Lawn Suit 4016-C & more dresses from Lawn Collection 2017 online and pay cash on delivery. Star Classic Lawn Suit 4016-C Price in Pakistan (Code: M009268) offer by PakStyle are just Rs.1195/- instead of Rs.2000/-. Buy Star Classic Lawn Suit 4016-C Online in Pakistan and variety of other products like Womens Clothing, Lawn Suits at PakStyle.pk and enjoy Fast Shipping with Free Home Delivery in Karachi, Lahore, Rawalpindi, Islamabad, Faisalabad, Hyderabad, Quetta, Peshawar, all across Pakistan and get it delivered in 1-4 working days.